A glimpse of four aoudad lambs. There is always a first for everything and I recently got to see Aoudad sheep (Ammotragus lervia) lambs for the first time. Thanks to my friend, Emily, who had already taken photos of these babes, I was on the look out for them as Sharla and I was driving into Carlsbad Caverns National Park in mid-March. Unfortunately, Sharla has never heard me scream “STOP” before, and this time I scared her to death. Off in the distance were the four lambs with their mom. I quickly grabbed my camera and took some rapid photos, before another car caught up with us on the road. If you don’t know Carlsbad Caverns road system there are no shoulders to pull off onto, only designated pullouts along the road. The mom and babes were not affected in the least by the car and patiently stood there saying, “Ok, we’ll give you a pose.” While the time that I got to see them was brief, the photograph immortalizes them for me. Someday these lambs will no longer be adorable, but grown adults possibly living with park. One surprising fact about aoudads is they are not native to the U.S. Their native country is the desert mountains in the Sahara region of northern Africa. Barbary Sheep or Aoudad was first brought to the U.S. around 1900 for rearing in zoos and private preserves. They were first introduced and released in New Mexico by the state game department in 1950 along the Canadian River Canyon to offer as exotic game to hunt. Aoudads would not be in Texas, except for the fact that landowners living near Palo Duro Canyon State Park pressured the state to help increase their local hunting incomes. 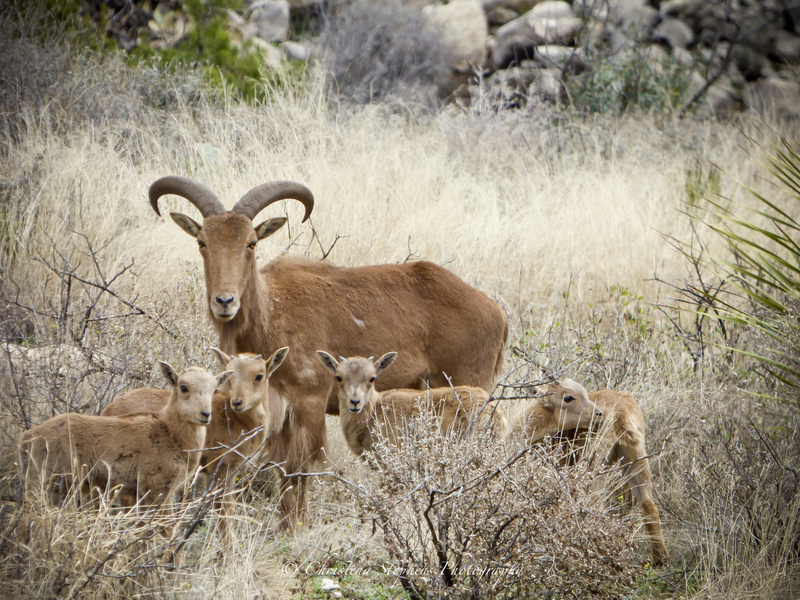 Texas Parks and Wildlife looked to the New Mexico release of aoudad. In 1957 31 were released southwest of Claude in Armstrong County, Texas. Another 13 more were released near Quitaque, Texas. The releases were successful and the population thrived to increase of between 400-500 sheep by May 1966. Aoudads are here to stay and the briefest glimpse of their lambs is a priceless experience. © Christena Stephens, 2014 – 2015. Unauthorized use and/or duplication of this material without express and written permission from this blog’s author and/or owner is strictly prohibited. Excerpts and links may be used, provided full and clear credit is given to Christena Stephens with appropriate and specific direction to the original content. May I have your permission to paint your aoudads? If so, I will give credit for your photo on the back! Thanks again Eilen for asking! That means a lot.